Enjoying dinner together with the entire family can be a fun way to relax after a tough day at work. 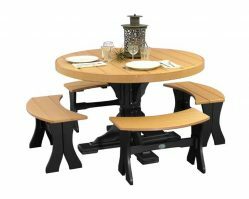 You can convert an ordinary family dinner into a special and memorable occasion by simply opting to eat out on your poly outdoor patio table and shifting your evening meal to your deck, garden, or lawn. There’s a cool summer breeze outside, and a starry night sky with lots of laughter, jokes and memories to be made in complete comfort! 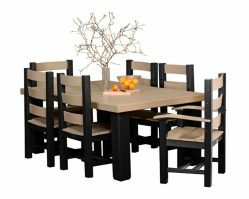 Opting for a dining collection made out of recycled plastic is the simplest and most elegant way to enjoy the outdoors without having to spend a small fortune maintaining your steel or wood furniture. 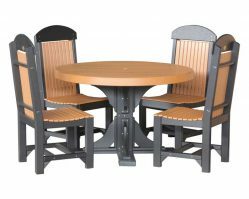 No need to worry about UV rays, humidity, rain, snow, or frost as long as you opt for durable plastic Outdoor Patio Dining Table Sets and patio outdoor furniture. 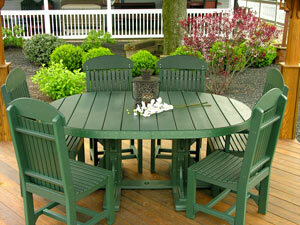 Outdoor Patio Furniture is not just about functionality and utility. The right colors, designs, and finish can make a huge difference to the overall aesthetics of your home’s outdoor space. Placing benches or swings with a dark wood finish and a backdrop of colorful flowers will make your lawn or garden a cozy place to relax with your spouse or entertain guests and relatives. On the other hand, brightly colored yard swings will encourage your kids to get off their electronic devices and spend more time enjoying family time together outside. 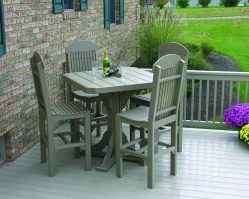 Our LuxCraft® plastic patio tables are designed to withstand exposure to the elements will retain its color, appearance, and finish much better and longer than wood or metal furniture. Further, resistance to pests, rot, and mildew will ensure you need not worry about risk of your outdoor furniture turning into regular summer work or a safety hazard. Give yourself a great excuse to bring the outdoors back into your life. 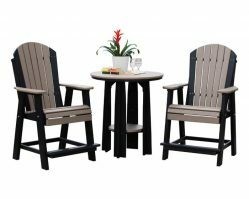 Opt for poly patio tables and enjoy some relaxing picnics on weekends with your entire family without stepping beyond your front gate. Invite a few friends to enjoy some spring barbecues and parties without having to worry about them being damaged from rough use. This furniture is tough! 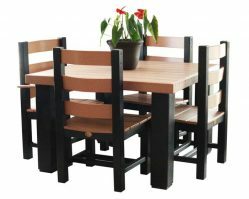 You’ll also get a lifetime guarantee on this 100% recycled plastic patio furniture, which makes it a smart and economical addition to your home’s exterior finish.